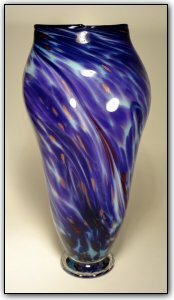 This hand blown tall vase features rich hyacinth purples contrasted with turquoise blue hues, and real sparkling gold and red accents throughout. It also features a deep black lip wrap on the top and a clear pedestal at the other end to make it sturdy. It has an asymmetrical shape to give it that hand made look and adds lots of brilliant purple color to the room.